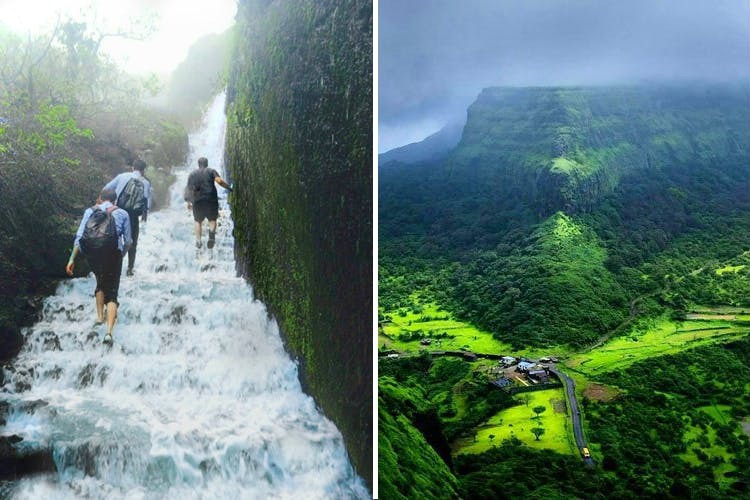 Visapur Fort is a fort in Maharashtra, where you have to trek through gushing water down the steps. That’s one for the realistic bucket list right there. This fort is located very close to Lonavala, about 2 hours (close to 98 km) away. You can either drive down to the fort, using the same route as to Lonavala via the Mumbai-Pune expressway. You may also save the money, and hop on to a train which departs from Dadar and CST to Lonavala, and then take a local train to Malavali, which is a 5 km walk or rickshaw ride from Visapur. Well, since you asked, let’s begin. There are twin forts that are very close to Lonavala – Visapur Fort and Lohgad Fort, of which Visapur is the higher fort. The path leading up to the fort is of medium difficulty. During the monsoon season, there is a mini waterfall that you have to trek through on the way to the fort. Although the path up will be slippery (carry good grip shoes), and the trek might leave you weary, but the view from uptop is amazing, with a glimpse of the Pawna dam as well. There’s a trek to Visapur fort on 15 July, for you to explore this gorgeous monsoon getaway. For details on the trek, timings and cost, click on this link. It’ll be a really fun experience, and you can make a trip with your friends here. The waterfall experience is only in the monsoon, so hurry up and go soon.